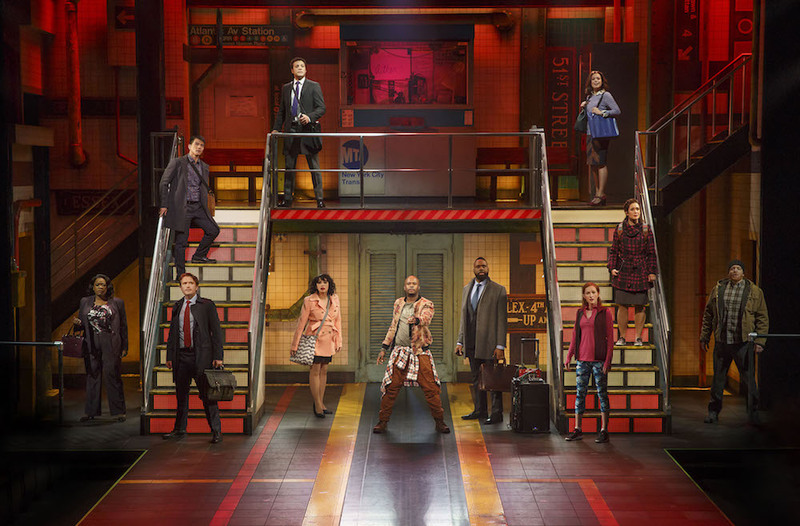 I’m ashamed to admit it, but I walked into In Transit, the recently opened a cappella musical on Broadway at Circle in the Square, with a major chip on my shoulder. I’m not a fan of cutesy doo-wop, and even the show’s logo—a MetroCard with a rainbow of transit lines cascading across my playbill—left me doubtful at best. Well… I’m eating my words. Or perhaps singing them without accompaniment, as the case may be. 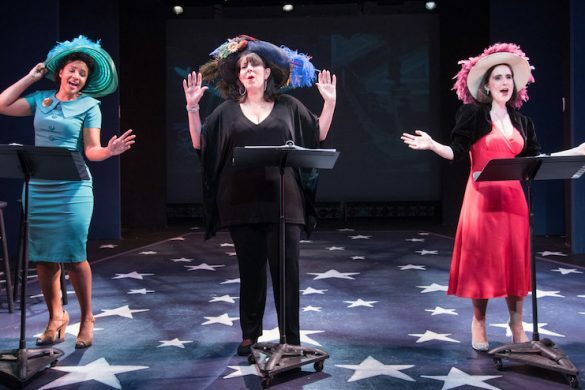 In Transit is a joyful, heartfelt, complicated celebration of New York City that will appeal to most tourists (unless you’re from Texas, but we’ll get to that) and jaded locals like myself. Directed and choreographed by Tony Award winner Kathleen Marshall (Anything Goes, Nice Work If You Can Get It), In Transit follows a cross-section of New Yorkers (mostly 30- and 40-somethings) as they weave their way in and out of the subterranean concrete jungle, creatively designed by Donyale Werle and beautifully lit by Donald Holder. We meet Jane (Margot Seibert), a struggling actress hoping to find her big break; Nate (James Snyder), recently fired from his high-paying executive job, along with his sister Ali (Erin Mackey), who is trying to bounce back from the end of a relationship by running the New York Marathon; Trent (Justin Guarini) and Steven (Telly Leung), a gay couple on the verge of marriage if Trent can come out to his conservative “Momma” (a show-stealing, Moya Angela, who also appears as Althea, a station attendant with an attitude); and a wildly talented ensemble who provide the framework for their intertwining tales, including Boxman (alternately played by Chesney Snow and Steven “HeaveN” Cantor). I saw Cantor lay down the gauntlet with his stellar beatbox skills, which could replace an orchestra’s entire percussion section. Music supervisor Rick Hip-Flores (Fun Home, Beautiful, Rocky) has his hands full with the material provided by credited authors, Kristen Anderson-Lopez, James-Allen Ford, Russ Kaplan and Sara Wordsworth. And while I can’t say I left the theater humming any show tunes, the complexity of these 11-part arrangements can’t go unnoticed. But it’s Marshall’s sensitivity to the material that keeps In Transit in tune. 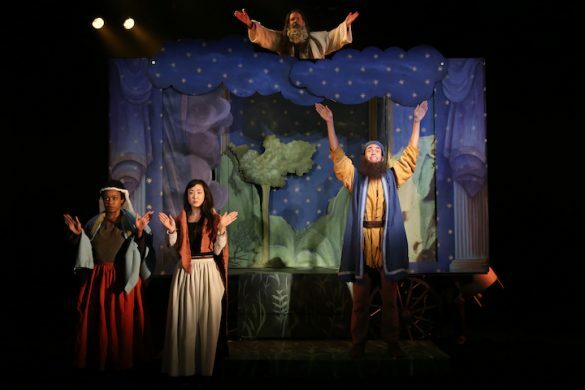 Played with heartbreaking honesty, you can’t help but feel for Seibert’s Jane when she lands her first Broadway gig and the surprising twist that comes shortly thereafter. Also handled with complicated aplomb is the unconventional outcome of Trent’s strained relationship with his religious-right mother from Texas when he questions whether to formally come out to her as gay. While mostly a celebration of New York City’s liberal views and diverse city streets, the only hiccup I felt was a sequence in which the gay couple goes to visit “Momma” and Texans are portrayed as backwater, gun-toting, simpletons. It’s a stroke brushed too broadly in an otherwise earnest script. 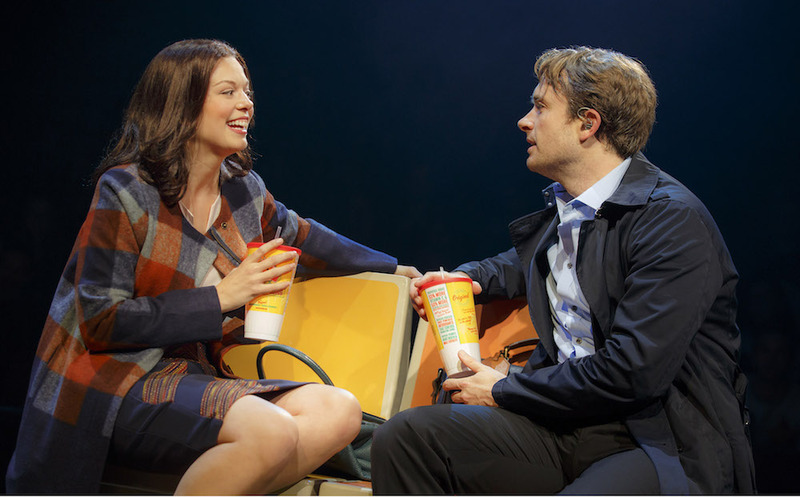 Seibert and Snyder, who appeared last season in Ever After (directed and choreographed by Marshall for Paper Mill Playhouse), have terrific chemistry, while Mackey’s broken Ali is a living snapshot of anyone who’s gone through a terrible break-up. 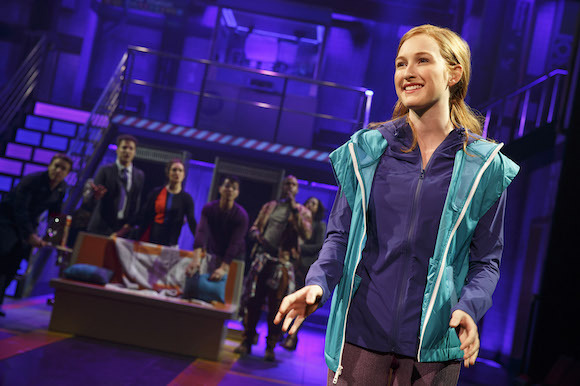 The cast of In Transit, with their pitch-perfect harmonies and purposeful movement, will gently tug at your heartstrings. In these times of “us versus them,” there’s a bigger message they’re delivering: We’re all in this together, and love and compassion are notes worth holding on to.